Dr. Doug works with each patient to create a custom plan of care to correct spinal misalignments (subluxations) and other joint problems to remove nerve interference — thus allowing the body to heal itself. Because each patient is unique, Dr. Doug will work with you to determine the best plan of care to treat your individual concerns. Doctors of Chiropractic focus on the detection, reduction and prevention of Central Nervous System interference. The central nervous system controls all function and healing of the human body and is made up of the brain, spinal cord and spinal nerves. Misaligned spinal bones or other joints cause compression, irritation and damage to delicate nerves. This nervous system interference is called "subluxation". The function of Chiropractic care is to facilitate the body's innate ability to heal itself by correcting subluxations through carefully directed adjustments of the joints. Adjustments alleviate the pressure on the nerves and enable the restoration of normal nerve function thus addressing the cause of illness or physical dysfunction. Subluxations are caused by a lifetime of stress and trauma. Slips, falls, auto accidents, sports injuries, poor posture, bad sleeping habits, stress at work, or even childhood mishaps and the birth process itself. During your first visit you will be asked to provide us with detailed information regarding your health history by completing our intake forms. You will be examined and if the doctor determines it necessary, X-rays will be taken. Dr. Doug will then evaluate these findings and present you with a verbal report to inform you of his analysis and recommended treatment plan. Doctors of Chiropractic develop specialties beyond their initial doctorates based on personal interest. Dr. Doug has chosen to pursue the post-graduate study of extremity adjusting. "My interest in extremity treatment was a result of my own full recovery from an injury to my shoulder, arm and wrist. When I saw how effective this treatment was for me I knew I had to learn these techniques to help my patients." 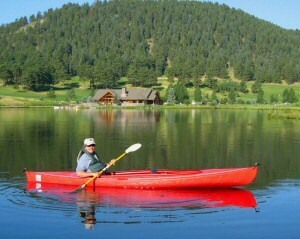 Like many of his patients, Dr. Doug takes full advantage of the Colorado lifestyle - hiking, skiing, kayaking, rafting and more. While fun, these types of sports can also cause injury - especially to vulnerable knees and shoulders! Since 1996, Dr. Doug has taken hundreds of hours of continuing education courses, many of which were in the study of extremity adjusting. Consequently, Dr. Doug has been able to help his patients recover from many sports related injuries.